Esse est percipi, to be is to be perceived is the famous line of the l8th century Anglo-Irish subjectivist philosopher Bishop Berkeley that Samuel Beckett disputed in his sole screenplay, Film--in which Buster Keaton played the leading role. Would Beckett have said, "to be perceived is to die?" Film, shot in l964, was commissioned by Beckett’s American publisher Barney Rosset, directed by the renowned theater director Alan Schneider and shot by Boris Kaufman the cinematographer whose older brother was Denis Kaufman aka Dziga Vertov director of the iconic Man With a Movie Camera (1929). All of this is more significant than it even sounds since Beckett shared the protomodernist rapture with celluloid that’s the basic theme of the Dziga Vertov film; at one point in his career he even applied to study with Eisenstein, while at the same time experiencing a rejection of photography not dissimilar to that of a body rejecting an organ transplant. 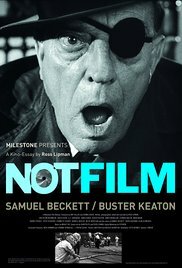 Notfilm, which recently completed a run at the Anthology Film Archives, is Ross Lipman’s movie about the making of Film. But Notfilm is less a documentary than a filmic homage to the original, adopting the form of the Beckett work in which the world that is being sought by the camera vanishes before the viewer’s eyes. Partly due to the vicissitudes of age, Rosset and the famous Beckett actress Billie Whitelaw (whose legendary performance in Not I, the film's title references) are interview subjects whose very being seems to dissolve in the course of Lipman’s encounters with them. Replication is a little like what water does to the Wicked Witch; in a famous moment of the original Film Buster Keaton’s vision of himself is met with great horror recalling the dopplegangers in both the Borges version of Dostoevsky’s The Double: A Petersburg Poem, The Other and also the terrified look of the nurse in the famous Odessa steps sequence of Eisenstein’s Battleship Potemkin (1925). The plot of Film is rather simple an Eye (E) is seeking to capture an object (O) and Lipman brilliantly frames the narrative movement of the Beckett work as a chase film, which segues perfectly from the heyday of silent film out of which Keaton emerged (Chaplin had been offered and declined the role). Lipman is a little like an obsessed lover who is competing for attention with the object of his adulation, only to fall short in almost oedipal way. Yet Notfilm is loaded with wonderful perceptions (“Soundlessness became for Beckett a metaphysical campaign,” Lipman comments at one point) and invaluable archival research.